Whew! What a summer! 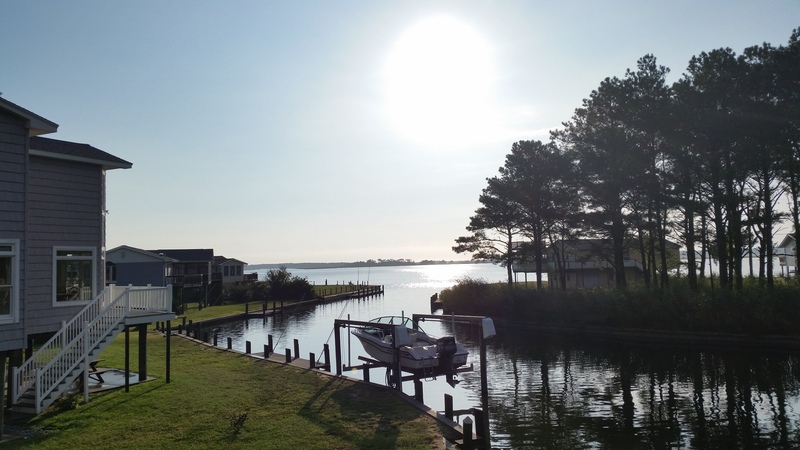 Four weeks in Puerto Rico, another week in Chincoteague, VA, plus wall-to-wall activities, nonstop writing for the Edible publications…it’s been great, but I am afraid I have not posted here as often as I would have liked. More garlic, cause that’s how we roll. If you think I have neglected this, you should see the #GardenofNeglect in my raised beds. Once again, the champion of zucchini failure failed to get even one lousy zucchini, bringing my three-year grand total to ONE. Ah well, fall plantings are in and I see a few radish greens popping up, so maybe we’ll get something going there now that we are home. 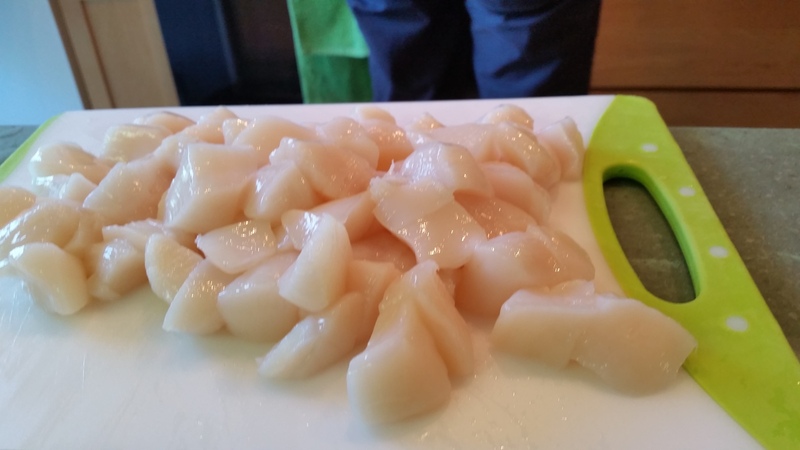 Anyhoo, this recipe is something my brother and sister-in-law put together while we were in Chincoteague to take advantage of the superb sea scallops available there. Apparently this is a new go-to for them in their home in Canada, warming without being heavy. They based it on a Food Network recipe that uses spaghetti, parmesan rind and much less garlic than my brother bungs in. 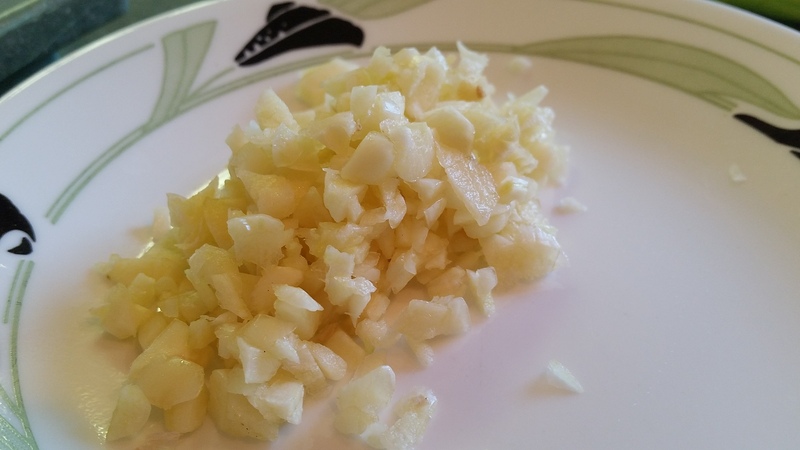 Why you would want to use less garlic is beyond my comprehension, but to each his/her own! You can use less than the amount called for in my brother’s version, but for my money, he has the right idea using a lot. 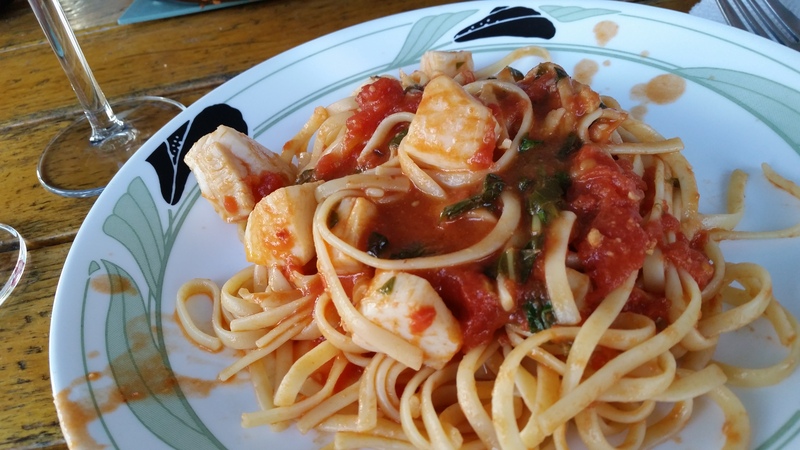 It was truly delicious, with bright clear flavors and not difficult at all to put together. I think it will become a go-to here in New York too! Cook pasta according to package direction. Before draining, reserve 1/4 Cup cooking liquid. Meanwhile, heat the olive oil in a saucepan over medium heat. Add the garlic and red pepper flakes and cook, stirring, until the garlic softens, about 1 minute. Add the tomatoes, 1/2 cup water and half of the basil. Bring the sauce to a boil, then stir and reduce the heat to medium low; simmer 15 minutes. Season with salt. Increase the heat under the sauce to medium high, add the scallops and cook, stirring occasionally, until opaque, about 5 minutes. Add the remaining basil, stir in the parmesan and season with salt and more red pepper flakes. Drain the pasta and add to the skillet with the sauce; toss. If you need more liquid, use the reserved cooking liquid. Divide the pasta among bowls, drizzle with olive oil and top with more basil. Here it is finally, a round-up of recipes for using summer tomatoes, including rescuing tomatoes past their prime and processing for freezing (without the trouble of canning!). Bookmark this one…. This recipe has terrible photos so I am not using them here, but great flavor. Try it! Bung these in the oven while roasting other veggies! By the time it came out of the oven, my natural light was gone…but you get the idea. Add crusty bread and you’ve got yourself a no-cook hearty cool meal! Next page: Bisque; Watermelon Feta and Tomato Salad, AND several ways to preserve tomatoes by freezing! Yup. 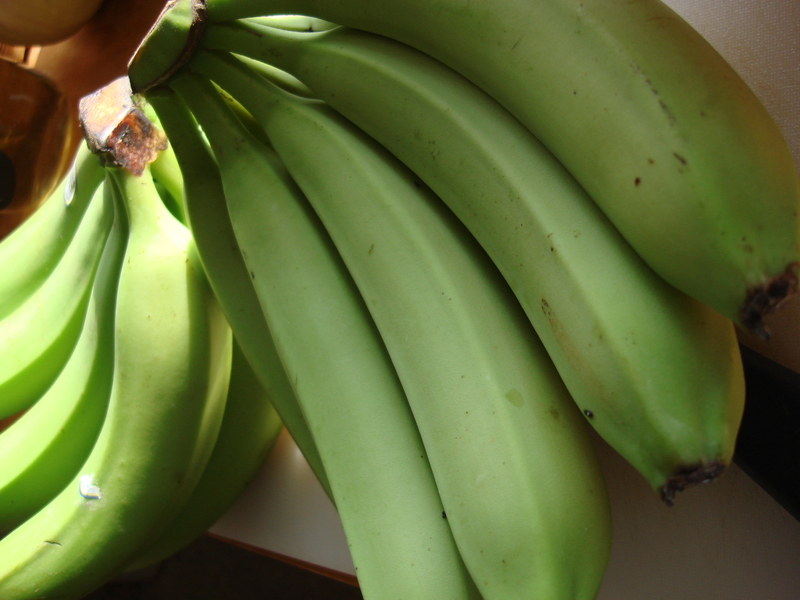 they are bananas. But they are green. This is how you prepare them for boiling. We made latkes for Christmas Eve. I know, these grated potato fritters are more connected with Judaism and Hannukah than Christianity, but they made perfect sense with our global tapas menu, plus my son is a very Old Testament kind of kid who is adamant that we need to have a menorah next year and who bought himself dreidels with his leftover money from the school holiday shopping fair. 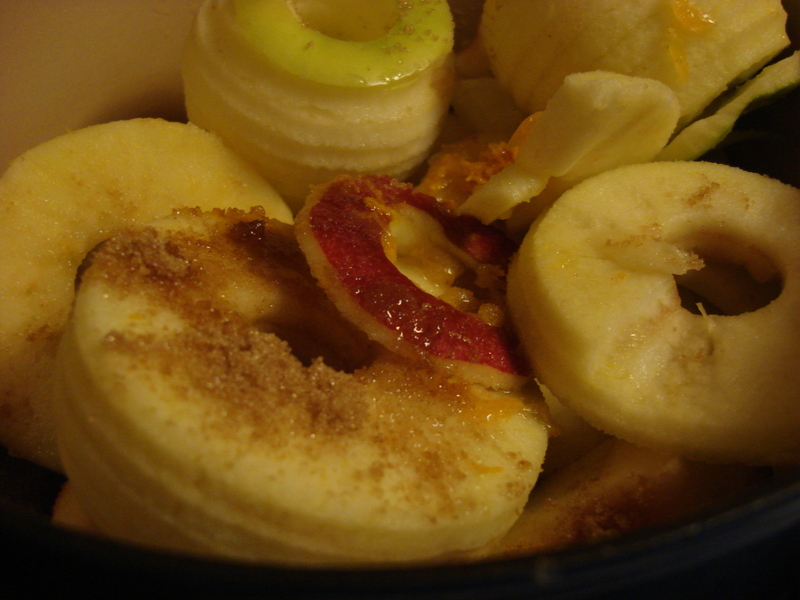 We used Roma for sweet, Granny Smith for tart, and Honeycrisp because they are delicious. Welcome to New York, where as the comedian Jackie Mason used to say, everyone is at least half-Jewish. Anyhoo, we are still working out our latke recipe, but in the meantime, they tasted very nice with the traditional accompaniments of sour cream and this apple sauce. Apple sauce is very easy to make and allows you to choose how sweet or tart and how sooth or chunky you want it. 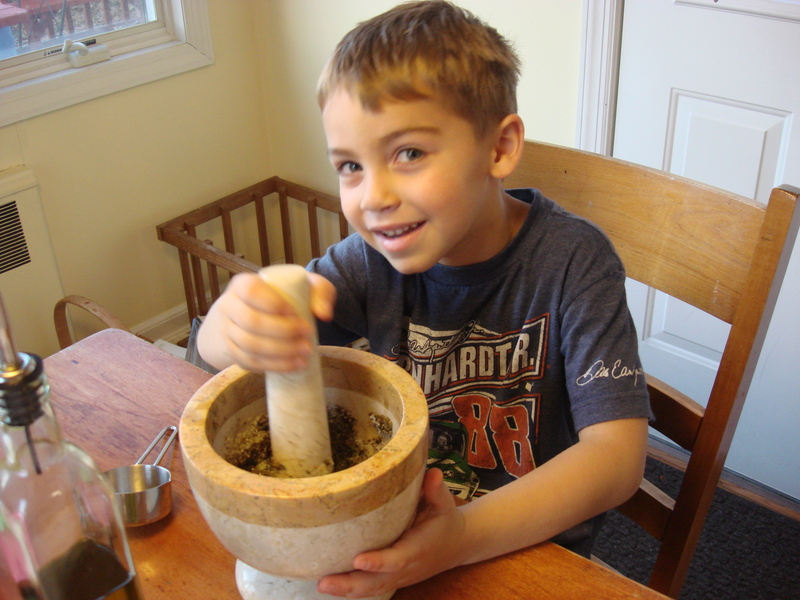 We have a fun apple peeler and corer, so the little guy can get involved too! 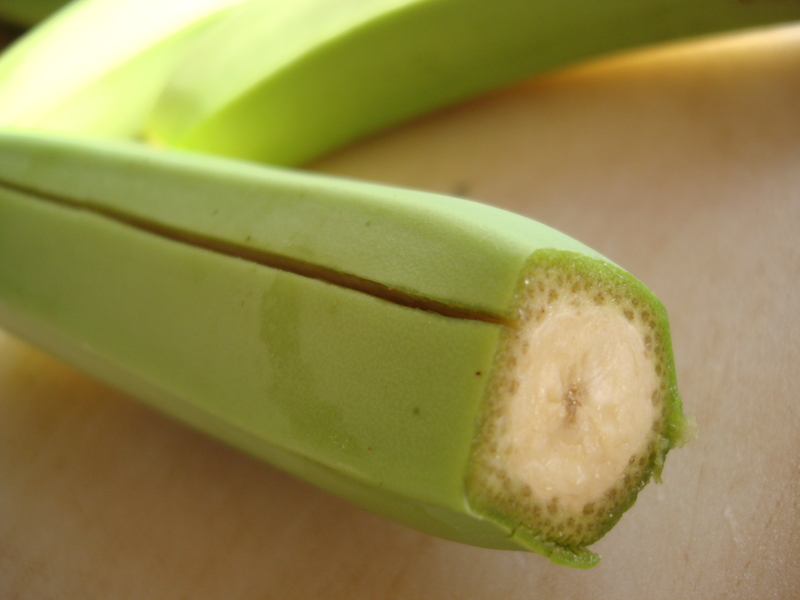 This corer makes life easier and more fun! While I wait, anxiously, for my own paste tomatoes to ripen before some sort of blight gets them (my tomatoes are abundant and my only hope left for a reasonable harvest of something this summer), my CSA, Restoration Farm, is piling on tomatoes of all stripes..I think we picked up 7-10 lbs this week alone, and since the friend we share with , Allison, has not been around, we’ve been taking it all home. 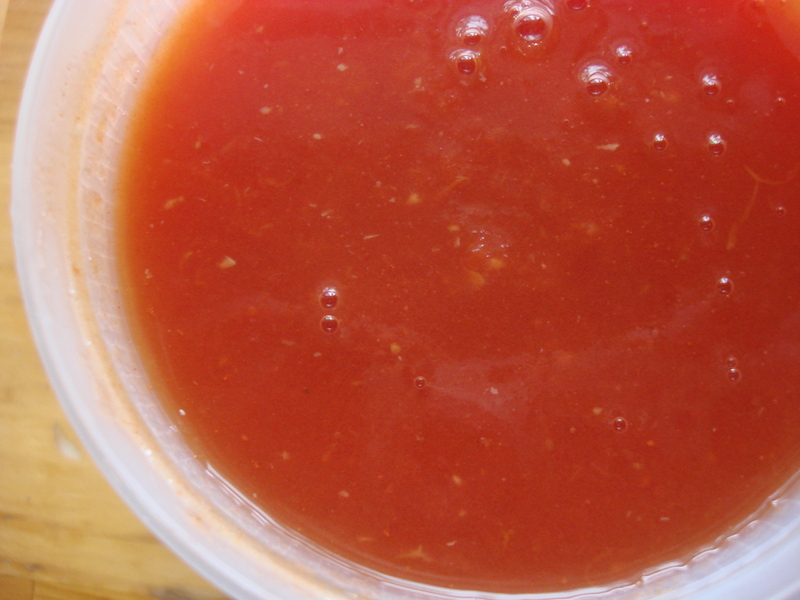 So…I have made and frozen a couple of quarts of sauce recently, using the simple recipe that follows. Bubbling puree. 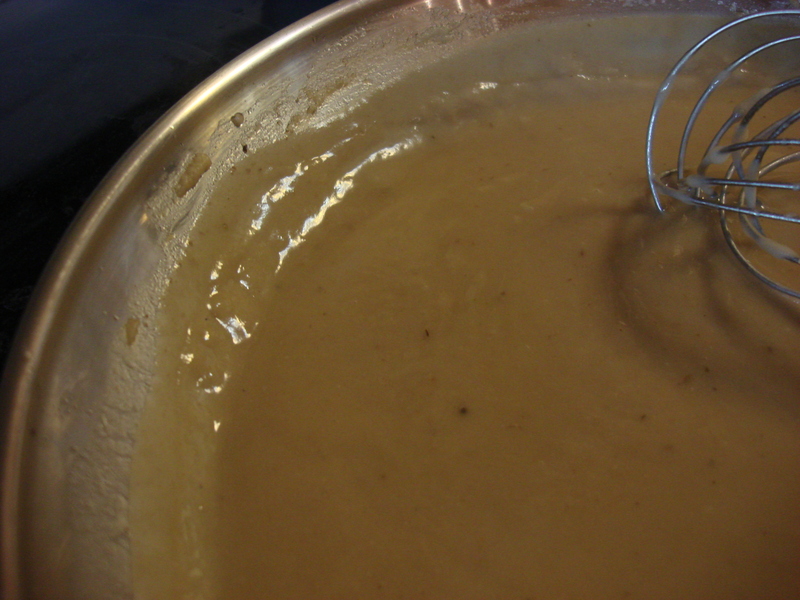 Stir occasionally to break up. There are other ways to do it (some cooks just blanch, peel and run through the food mill and don’t cook it at all; while some, including me, just blanch and freeze whole tomatoes), but I like this because the puree is smooth and ready to go in a pinch and the hint of garlic gives it a round flavor without taking it in a particular ethnic direction. I strain the sauce through a regular strainer, then eat the seeds and solids! The blanching may seem daunting at first and yes, it does add time to what you are doing, but it is so simple and I like to watch the tomatoes float up and down in the bubbles and slipping off the peels so easily is somehow satisfying. So give it a try if you get your hands on some paste tomatoes and enjoy summer freshness when there is snow on the ground! The final product! 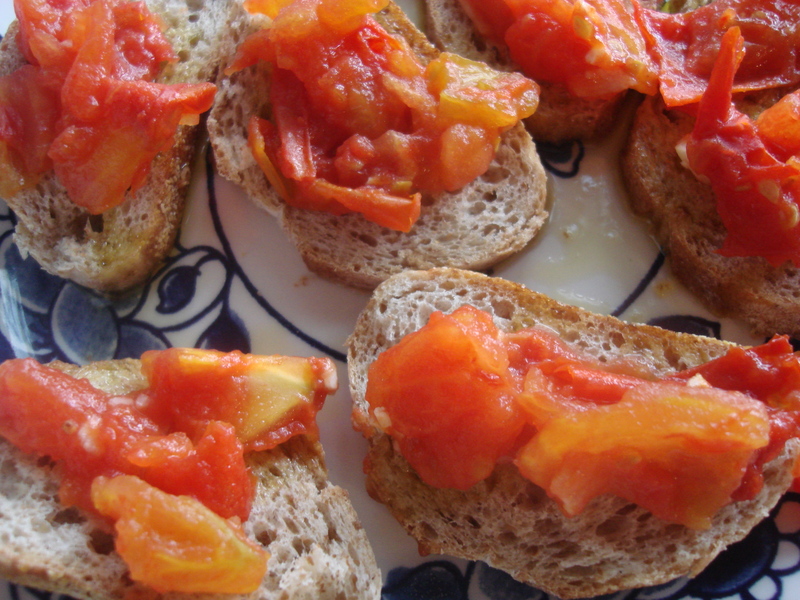 Tomato puree that will be great when the weather turns…. 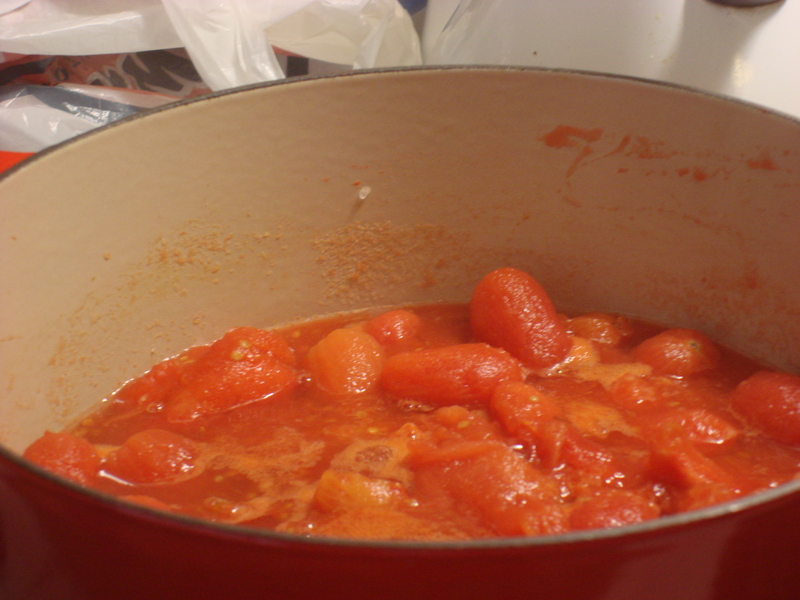 To blanch tomatoes, put a big pot of water on to boil. Be ready with tongs and a big bowl of ice water on the side. Rinse and core tomatoes. Drop into boiling water (you will probably have to do batches). 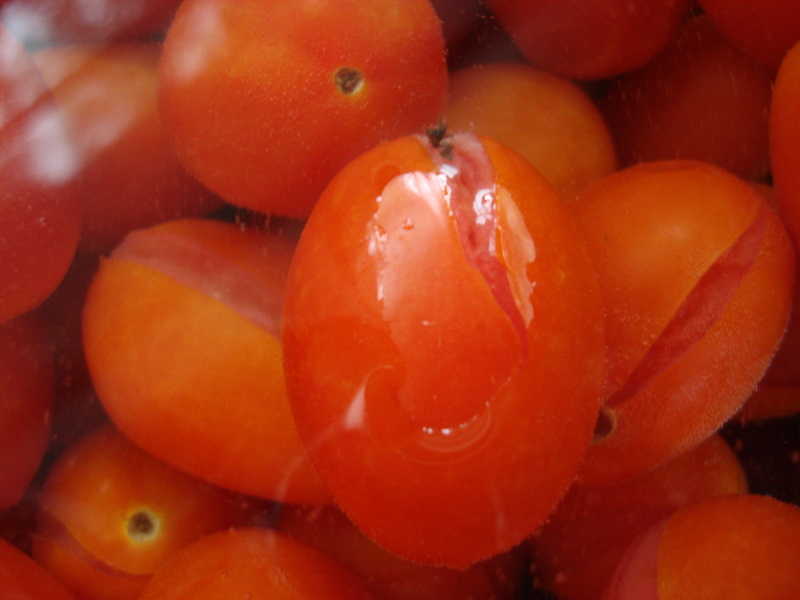 Remove each tomato as soon as its skin starts to wrinkle/split, and drop in the ice water. Once the tomatoes are sufficiently cooled to handle, slip off the peels and discard peels or add to stock (thanks John Picardi, or was it Mad Dog for that tip!). 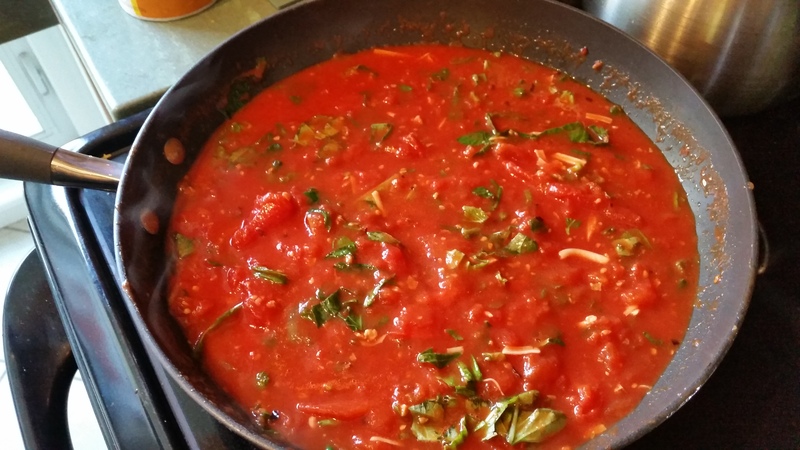 Dump the water from your big pot and add the peeled tomatoes, split or chopped in half if you like. 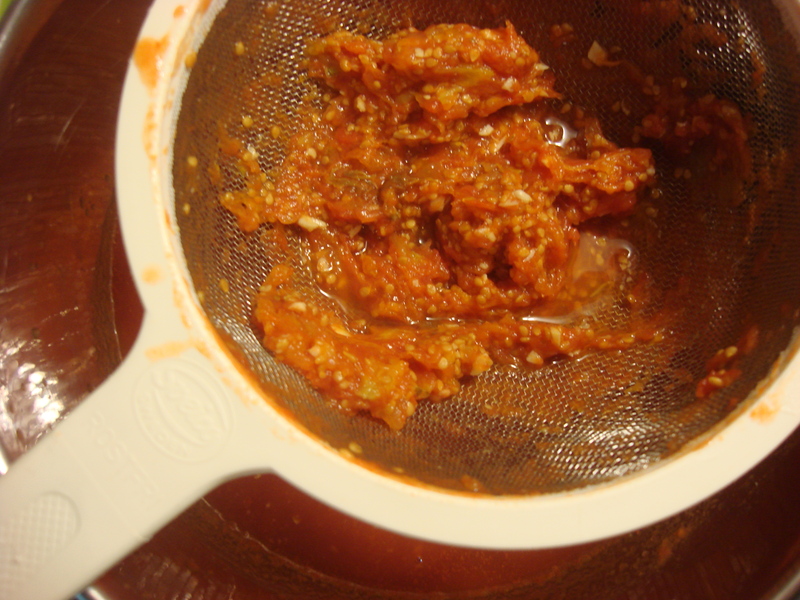 (If you have a food mill, you can put the tomatoes through the mill first to eliminate seeds. Or, there is another suggested way to do it later in the recipe). Add garlic and salt, bring to a boil, then simmer for five, ten, 15 minutes…however long you want. The flavor is bright early on and mellows somewhat with more cooking, so it is up to you which you prefer. When you’ve reached desired flavor, let cool. At this point, since my food mill is missing a piece, I press the sauce through a strainer into a bowl. The solids remain in the strainer and…true confessions…I use that as a spread on toast because the seeds don’t bother me there, but they do bother me in a smooth sauce. Then pour the sauce into a freezer-safe container (you will yield anywhere from a pint to a quart depending on quantity of tomatoes and how much liquid evaporated in the cooking) and freeze for a fresh neutral tomato puree in the middle of winter! I have such good memories of Old Madrid, fragmented yellow afternoon light poking into the bar from the narrow street outside; standing at a stainless steel bar focused on stabbing mushrooms with a toothpick as they swam in garlicky sauce in a red clay cazuela, the peasant poetry of light red wine poured into a homely, stemless glass with a thick bottom, crusty rounds of bread crumbling under your elbows. Nothing better to do than spend the summer evening exploring more windy streets and more interesting little appetizers. Let’s start by saying that I did NOT screw up the gravy this year. (Click here for last year’s debacle). In fact, it was smooth, fragrant and delicious. Brining the turkey requires just a bucket, a trash bag, salt and water. The difference it makes is amazing! However, (you knew this was coming) it was also too damn salty. 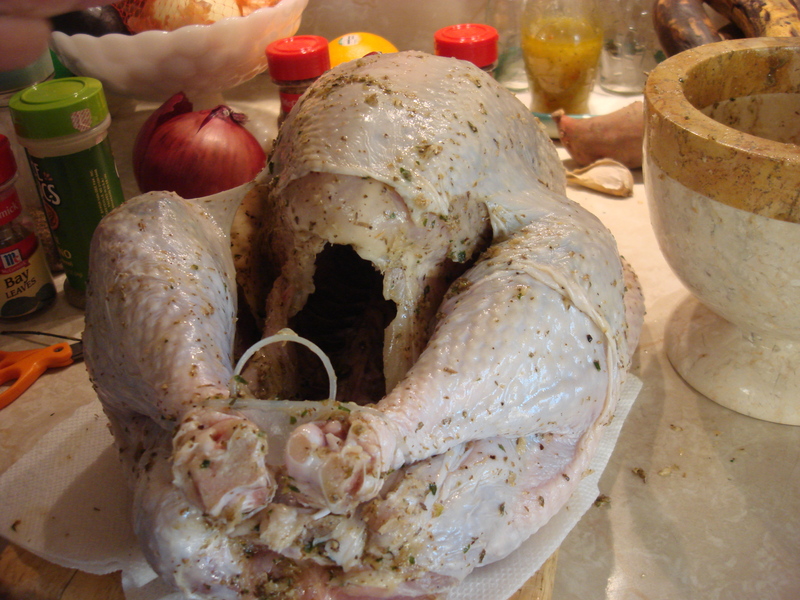 But… Pedro’s turkey, duly brined and seasoned Puerto Rican-style, was juicy, tasty and all around wonderful. And I have worked out why and the gravy recipe (which may very well be repeated at Christmas, and certainly next Thanksgiving) has been modified accordingly. So what happened with the gravy? Two things. Usually to make the turkey stock I add my own home-made chicken stock which has little or no salt additional to whatever salt the carcass I used brought with it, or I buy low-sodium stock to simmer in conjunction with the turkey necks. This time, I used store-bought chicken stock with all the salt, thereby adding salt where none was needed. Two, the pavochón-style spice rub (adobo) that is actually a recipe for roast pork/roast suckling pig modified for turkey is saltier than what we usually prepare (and Pedro cut the amount recommended in the classic Cocina Criolla by Carmen Aboy de Valldejuli in half!). The turkey was perfectly salted, but the pan juices that I relied on for the gravy were much saltier than I anticipated. So, live and learn. The solution? The next time we make this particular adobo, I will make sure that I have my own no-salt stock laid by for the gravy. And this time, at least, my mom didn’t have to bust out the jar of gravy. I think this time she didn’t even buy one. I appreciate the vote of confidence. 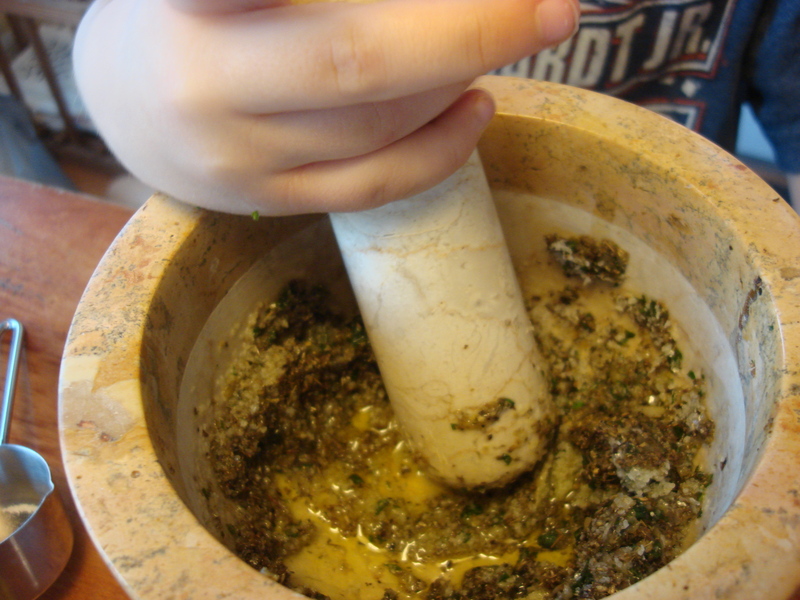 Use the ingredients in the mortar and pestle to season the inside and outside of the bird and under the skin. Leave some of the spice paste in the mortar and pestle and add additional oil; you will be using this for basting. Stuff the turkey with the ingredients for the cavity. Tie the drumsticks together and pin the wings to the body with small skewers. Put the turkey on a rack set in a large flameproof roasting pan and roast in the center of the oven for 30 minutes. 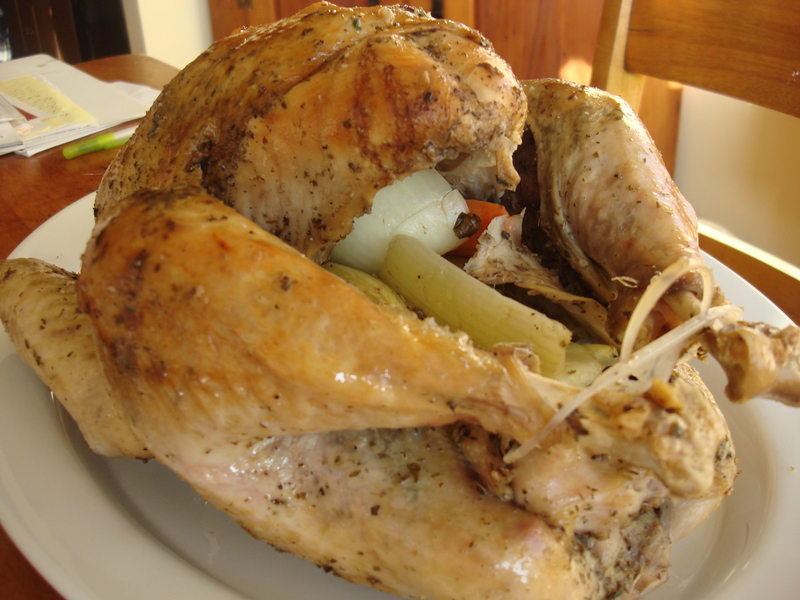 While turkey is roasting, toss the orange chunks and onion in the butter and oil listed under gravy ingredients. Reduce the oven temperature to 350°F. Brush more spice paste (adding oil if necessary) all over the bird. Put the orange chunks and onion underneath the rack (this will season the pan juices which you will need for the gravy) and return the turkey to the oven, basting every thirty minutes until an instant read thermometer inserted into the fleshy part of the thigh reads 170°F. 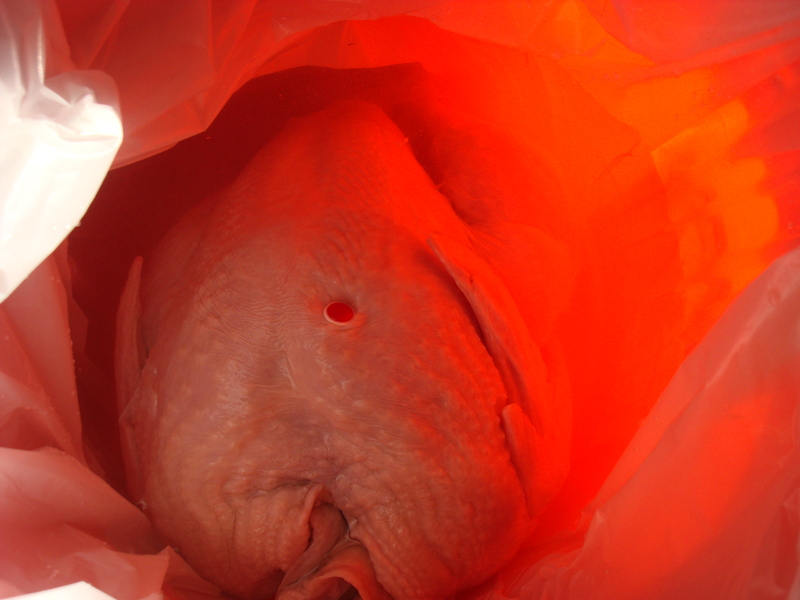 Important note: We also had a pop-up thermometer in the breast, which popped up waaaaay before the thighs were cooked (a typical problem and the reason why the breast on roasted whole turkey is often dry and overcooked. We simply turned the turkey over onto the breast and kept roasting, sacrificing crispy skin for juicy breast. 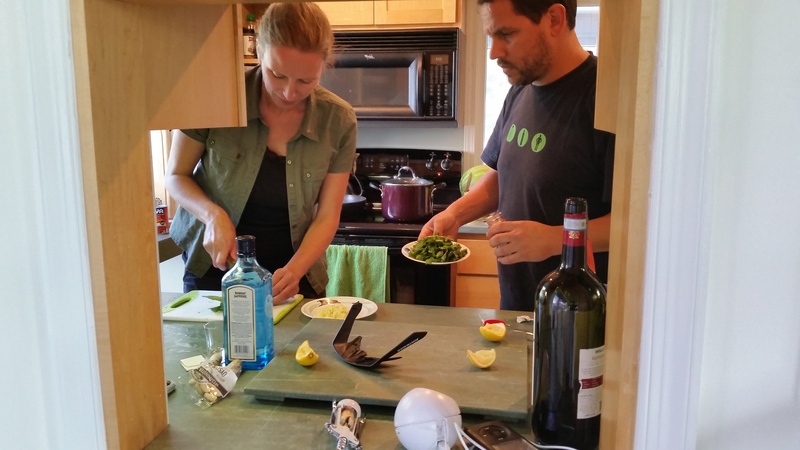 You decide what you want – we may actually cook the bird in pieces next year – but having two different thermometers for the two major zones of the bird was very helpful). 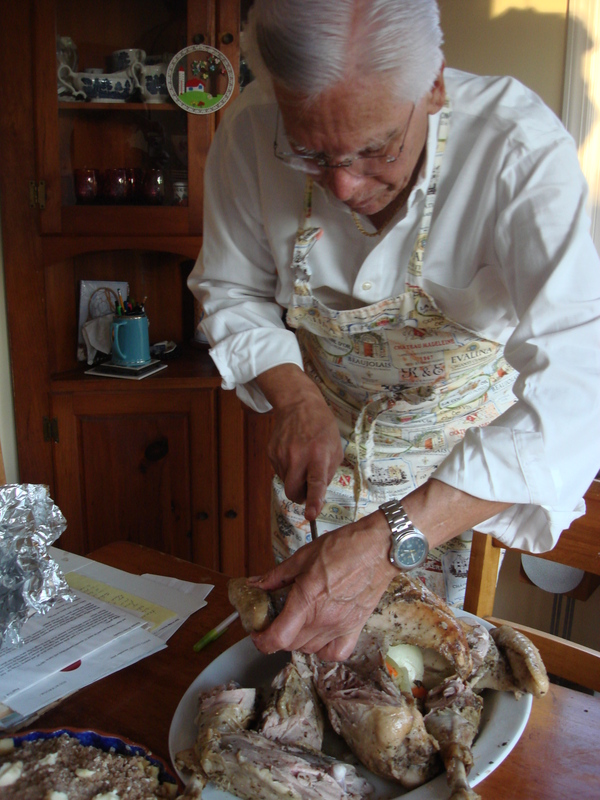 When the bird is done (total roasting time is 1.5-2 hours), remove and discard the vegetables in the cavity and let the bird rest on a platter for an hour before slicing. 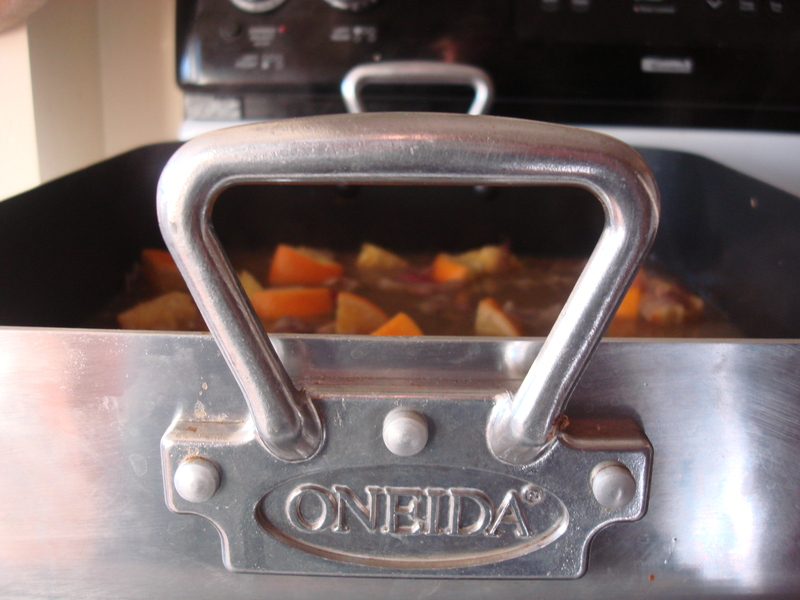 Transfer the pan juices (with oranges and onions) to a 2-quart glass measure, then skim off and reserve ¼ Cup fat. Add enough turkey stock to bring the pan juice level to 4.5 Cups. Set roasting pan across two burners, add one cup of the pan juice mixture and deglaze pan over moderately high heat, scraping off any brown bits. Add the rest of the pan juice mixture and bring to a simmer. Strain through a fine sieve back into your 2-quart glass container and discard the onions and oranges. Serve turkey with gravy on the side. Regular readers will know that I disgraced myself last Thanksgiving by ruining the stock for the gravy; I put the liver in and rendered the stock (and the air in my kitchen) utterly disgusting. My mom triumphantly saved the day with a jar of gravy and I was mortified on many levels. I have just done a listening exercise with my ESL students on The Marshmallow Test … a 1960s experiment that offered four-year-olds one marshmallow off the bat, but an additional marshmallow if they could just wait alone in a room for 15 minutes with that first marshmallow and not eat it. Astonishingly the findings over time showed that kids who could delay gratification for longer times at four, were likely to be more successful socially, educationally and professionally when they grew up than the kids who couldn’t wait and sucked that first marshmallow down as soon as they were alone with it.